The first full week in May is designated as appreciation week for teachers and nurses, and in our schools, the local PTO plans a week of nice surprises for the teaching staff. One day might be a luncheon. Another could be a day of raffles and winning prizes which have been donated. Sometimes they provide a breakfast. A few years included massage therapists coming in for 10 minute chair massage opportunities. In the past I’ve helped to coordinate appreciation week for our schools but recently I’ve stepped down and help just by donating food for whatever special opportunities are being provided. This year, I made a couple of soups for the luncheon and signed up to bring in desserts for a special salty and sweet day the PTO planned. 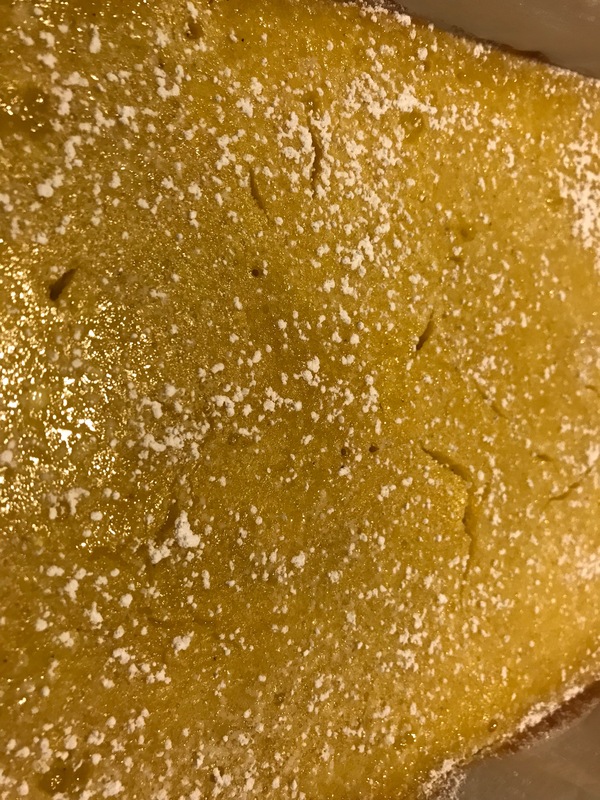 Since I wasn’t sure what to make for the dessert, I asked for ideas from the staff, and someone mentioned that it would be lovely if I could make lemon bars for those with dairy, soy, gluten and nut allergies, all of which were prevalent among a number of the teachers. Since usually the bars I make are made from tofu, which was one of the allergies, I looked up a basic lemon bar recipe to revamp. The recipes I found were all pretty much the same: To make the crust, mix 2 cups of flour, 1 cup butter, and 1/2 cup sugar, which was baked in a variety of pans sized from 8 x 8 to 7 x 11. The filling was usually 4 eggs, 2 cups sugar, 1/4 cup flour, and lemon juice which strangely ranged from 1/3 cup to 3/4. For the flour: It was easy to simply substitute the flour with a gluten free flour blend. I chose King Arthur’s whole grain blend which is my current favorite since it is easy to get at the grocery store and has more protein and fiber than the other blends. For the butter: To make the bars dairy free, I simply used Earth Balance’s soy free vegan butter. For the sugar: The sugar was where I simply had to make some cuts. 2 1/2 cups of sugar in bars in an 8 x 8 or 7 x 11 or 9 x 9 pan is just too much sugar. I opted to use only 2 tablespoons in the crust, switching powdered sugar for the white sugar because it would combine more easily with the flour. And for the filling, I reduced the amount to 1/2 cup of white sugar and used 1/4 cup agave. As a final change, I used a 9 x 13 pan for thinner bars. For the lemon: As a general rule, I suggest folks use fresh lemons for lemon bars. As I was looking at the recipe, I decided that I wanted to change things up a bit, so I opted to make citrus bars instead where I mixed freshly squeezed lemon and orange juice together. I also decided to add cardamom which is a spice that I like, just to further change things up a bit. Since the recipes varied greatly in amount, I cut the difference and used 1/2 cup of juice. When I went to the school later in the day to help clean up, several staff stopped me to say how much they enjoyed the citrus bars, mostly because someone thought to make something they could eat, but also because they liked that the bars had so much less sugar but still tasted good. Line a 9 x 13 pan with parchment paper. Preheat the oven to 350 degrees. Mix the gluten free flour, powdered sugar and cardamom together. Using a pastry knife or two knives, cut the butter into the flour mixture until crumbly. Spread the crust mixture into the prepared pan and use your clean fingers to press the mixture evenly into the pan. Bake in the preheated oven for about 15 minutes until the crust is puffed and golden. While the crust is baking, mix together the eggs, sugar, agave, flour, cardamom, and lemon and orange juices. Pour the citrus mixture over the hot crust and spread evenly. Bake in the oven, another 15-20 minutes until the filling has solidified.